As a gamer with limited experience playing driving sims, I have often underestimated the effect that a nice racing wheel can have on player experience. I'll often enjoy playing Euro Truck Simulator or Forza Horizon casually, but I'm aware I'm missing out on at least some of the appeal of realistic driving experiences. While I have owned low-end racing wheels in the past, the Thrustmaster TMX is the first medium range gaming wheel I have put significant time into using, and I can certainly feel what the bump in cost brings to the table. The TMX, while functionally near identical to the PS4 T150 wheel, is a very solid mid-range wheel for players looking for decent modular customisation options, variable force feedback and strong console software support. Just bear in mind support for PC games will be a lot more inconsistent. 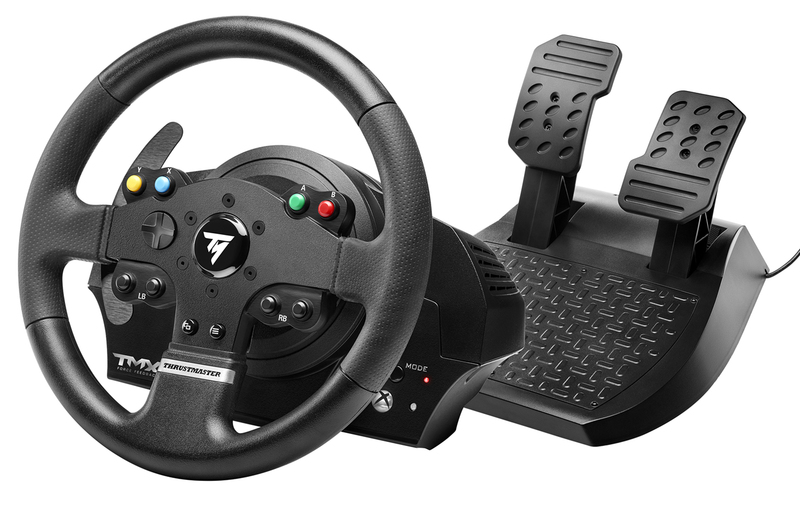 For owners of the Thrustmaster T150 force feedback racing wheel, here's a TL;DR of this review: the TMX is essentially the same wheel and pedal set, but with a 900 degree angle of rotation instead of the T150's 1080 degrees. Otherwise, it's essentially the same wheel with Xbox One and PC support in place of the PS4. For everyone else, let's dig into the meat of this review. The TMX is a primarily plastic wheel with rubber grips on either side, a pair of face buttons for each controller bumper, A B X Y buttons, a D-Pad, and a pair of five inch metal paddle shifters positioned behind the wheel. The wheel is connected to a heavy plastic base, which comes with a desk clamp to keep it in place during gameplay. The TMX also comes with a pair of plastic pedals, which can be set at variable angles, and the break pedal features progressive resistance. The pedals worked well, but if you don't have a solution to hold them in place, their lightweight design will leave them moving away from you during play. The pedals felt a little less sturdy than would be ideal, but they were sensitive enough to be effective in gameplay. The TMX worked well out the box for Xbox One racing games, but took a little more work to set up and make use of on PC. 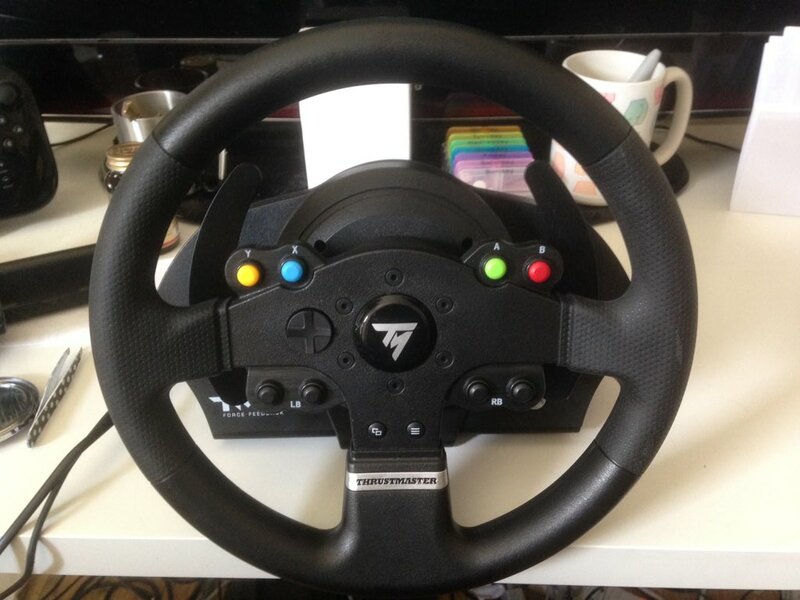 On Xbox One I played Forza 5, Forza 6, Forza Horizon 2, F1 2015 and Dirt Rally using the wheel, and had no issue getting any of the games to recognize it or the pedals correctly. The force feedback functionality of the wheel was always contextually appropriate, adding to my immersion in the game, and the wheel was always correctly calibrated, set to a very reasonable sensitivity level and balanced well. When playing on PC, my experience was far more inconsistent. After downloading the necessary drivers from Thrustmaster's website, I jumped onto Steam to see which of my driving games would correctly identify the wheel, and found that while some direct simulations picked it up without issue, more arcade-style games often refused to recognize the wheel or pedals as valid inputs, even if I attempted to set up custom controls on a game-by-game basis. While games like Euro Truck Simulator picked up the wheel without issue, I could not set the A B X Y buttons on the wheel as controller inputs in games that did not explicitly support wheels. It's either recognized as a wheel, or not recognized at all as a control input method, which was a frustrating split for someone fairly new to the world of mid-range racing wheels. When correctly recognised by games, the TMX did a great job of adding a layer of immersion to the experience. The multitude of diffrent effects, from rumbles, to smashes and hitting walls, to skidding on loose material, did a great job of highlighting at any time what was going wrong. As a VR headset owner, the wheel re-centering itself when left untouched and the force feedback really helped to keep the controller orientation in mind without being able to see it. Overall, the TMX racing wheel is a pretty sturdy mid-range racing wheel. If you've got a few hundred dollars lying around for a wheel and force feedback is important to you, you could do a lot worse than this for Xbox One. Just be aware of the lightweight pedals and intermittent PC game support.